This Guemes Island retreat is situated on a 20-acre, steep bluff waterfront site, perched on a serpentine stone wall and is invisible from the beach below. The western waterfront view overlooks the other San Juan Islands. The house was designed first as the family retreat, then as a gathering place for extended family and friends. The entry approach passes through one of three arched portals and frames the natural scene beyond. 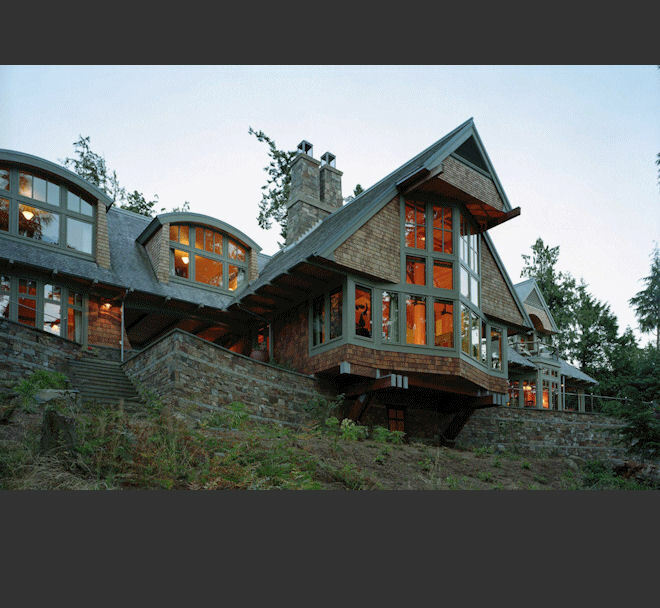 The aesthetic is one of a refined shingle style lodge. Every aspect of the design was highly considered from random shingle coursing to the placement of each stone in the fireplace, with the intention of creating a timeless gather place.